the ebony floors…the ship lantern. A bit more south…In Miami. love the bench and chair and table. sold it in a garage sale for 15 clams. I don’t even like sweet tea. Another Southern Belle...in Alabama. Love those shutters. can I hear another whoo hoo for me! Gorgeous!! They all float my boat! Oh yeah - my boat is definitely afloat in the second AND the fourth ones, thankyouverymuch. I LOVED the 1st one. And I liked each one for different reasons. Until I got to the last one. Then that one was IT!!! I would LOVE to do a space like that. I never would have tho't of using those colors together. It is festive & fun & just takes you away! I liked many of them, but that porch with the shutters begs for me to jump into the computer and live there. I think part of me was supposed to be a southern gal instead of a chicago one. My boat is more than floating! They all are so inviting, but I must say the last three sang my heartsong, and why am I not surprised that San Miguel is a favorite of yours? It's our getaway hideaway! A truly special place. Your posts always start my day off in the best way! Gorgeous! Hi! My favorite photos too! Great post! Yep....feel hoo'd and woo'd and warm all over. Sighing against the grain, like reaction wood. I live in New England said the southerner... sounds wrong. Immoral. 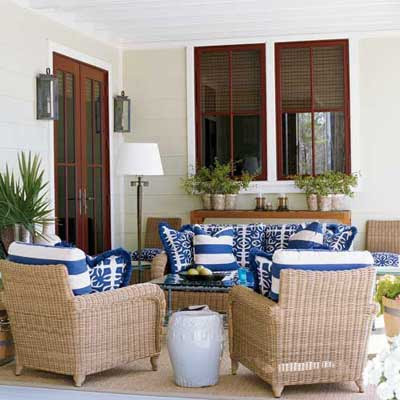 Love those shutters - looks like my childhood home. But now, years later, I need the sizzling color and relaxing heat of Miami to cure slow thawing joints. the dark ebony wood floors contrasted by white with bright pillows and the morroccan lanterns and the bromeliad arrangement...thats my spin! they are all so pretty, but the green shuttered 'porch'is where i see myself spending time. Gorgeous! I especially love the ones with the Moroccan or Spanish influence, but I'd be happy with any of them. Oh, and that color of green in the photo from San Antonio! Yes, please! Palm beach with Moroccan floats my boat. Have been looking for a little table like that. 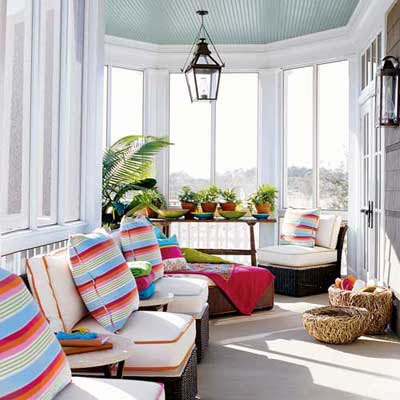 Then again, just to have a beautiful patio even close to any one of these...sweet. 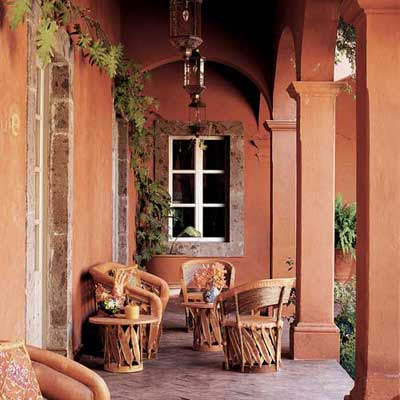 Love the pastel stripe pillows.... and definitely the luxuriant plants and space in San Antonio... what a great space... earthy and gorgeous! 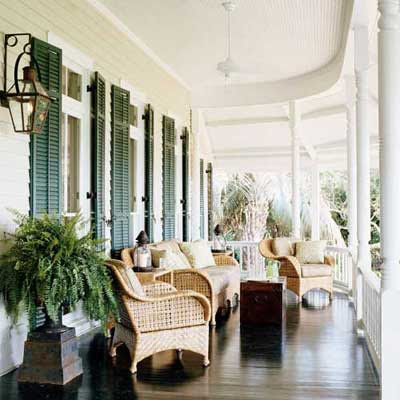 I love me a wide and generously outfitted and welcoming front porch. Here in the gray, rainy Pacific Northwest they don't really have need nor seem to know what to do with a porch. I can remember all my elders taking chairs out onto the lawn in the night during the summer when there were too many of them for either the porch or they were smoking. Fireflys and Grandpa's voice in that Kentucky drawl. Love the hanging Moravian Star lights! Do you happen to know where to get those? I've been on a quest. I want to put one in my entry hallway. I don't think I can pick a favorite, they are all so inviting. I'd like to grab a margarita and sit for a spell. Outdoor living...the height of fabulous! That DOORS in the San Antonio space....ADORE them. They are all gorgeous - but I think #2 and #5 are my absolute favorites. Sigh..
San Antonio, here I come! San Antonio pics take the cake for me though. I love that warm palette. Love the southern belle and oh, what... I love them all! I love comfort and nature and colors, maybe the last one a little bit more, my boat floats gently down the dream!